At Pelloux Sports, we offer our customers the top brands for equipment rental of skis, snowboards, cross-country, sledges, and snowshoes. We also offer the clients the option to book online via our website and take advantage of fantastic discounts. We love our customers and always go the extra mile in attempting to offer the best value. We really do are about our customers. You can always count on Nicolas and his team to always provide a friendly welcome and fantastic service. Not only do we offer free ski storage during your holiday, we can also hang on to your equipment all year long. Of course, for clients visiting from outside France, our team speaks English. If you are looking to purchase new material, we offer the option to test your gear before deciding. Our expert staff knows all of our top brands inside-and-out and is happy to offer advice to ensure that you find the perfect equipment. 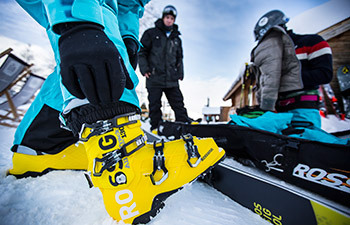 We carry top brands like Rossignol, Atomic, Blizzard, Volkl, Volant, Head, Nordica and Salomon. Looking for free ski storage 50m from the cable car ? C'EST CHEZ PELLOUX SPORT ! Pelloux Sports is a ski shop in Megeve that offers clients top brands for ski and snowboard equipment rental and purchase. We offer online booking through skimium.com. The shop is located 50m from the Chamois bubble lift. Ski storage is free for our clients. We are also open in the summer and offer a selection of hiking gear. Pelloux Sports has been a fixture in Megeve for over 50 years. Since 2008, Nicolas and his team have been welcoming clients with the perfect mix of friendly service and expert advice. Pelloux Sports is open all year round. In the winter, we are open from 8.30am to 7pm. In the summer and autumn, we are open from 10am to 12.30pm and 3pm to 7pm.